A group of seven Harvard student activists filed a lawsuit on Wednesday alleging that the University is violating its original charter through continued investment in fossil fuels and asked a court to force Harvard to “immediately withdraw” its holdings in the industry. All the plaintiffs are members of climate change activist group Divest Harvard, according to the campaign’s co-director, Canyon S. Woodward ’15, who is not affiliated with the case. Divest Harvard has continually battled with University officials on the issue of divestment from fossil fuel companies since its founding in 2012. Some faculty members have also called for divestment, most notably through an open letter to administrators on the subject this past spring. 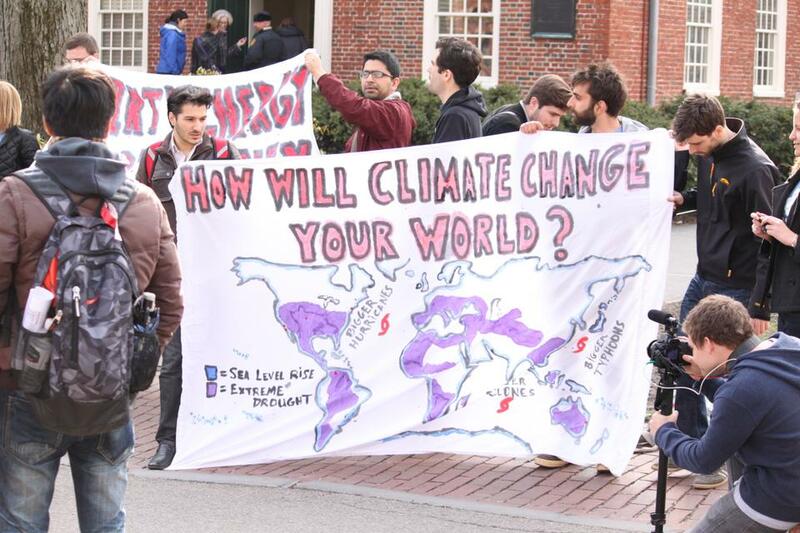 Students assemble outside Massachusetts Hall during the Harvard Divest Rally to call for divestment of endowment funds from fossil fuels on April 11, 2013. The suit, which the complainants filed in the Suffolk County Superior Court, names the Harvard Corporation, the Harvard Management Company, and Massachusetts Attorney General Martha M. Coakley as defendants in the case. HMC oversees Harvard’s more than $36 billion endowment. The complainants will not be represented by a lawyer, according to their website. The New York Times first reported the pending lawsuit Wednesday. The Harvard Climate Justice Coalition's lawsuit is hardly the first public call for divestment from Harvard affiliates. Last spring, members of Divest Harvard blockaded Massachusetts Hall, which prompted the arrest of one protester, Brett A. Roche ’15. Skaggs, for her part, said Wednesday that the group sees the lawsuit as another means to put pressure on Harvard to divest from fossil fuels. The other complainants in the case include College students Talia K. Rothstein ’17, Olivia M. Kivel ’17, and Sidni M. Frederick ’17; Law School students Joseph E. Hamilton and Alice M. Cherry; and Graduate School of Arts and Sciences student Benjamin A. Franta. According to The Times, the group's legal arguments are "unusual," with some lacking apparent precedent.